In this series of posts I will examine and compare different eCommerce CMSs. 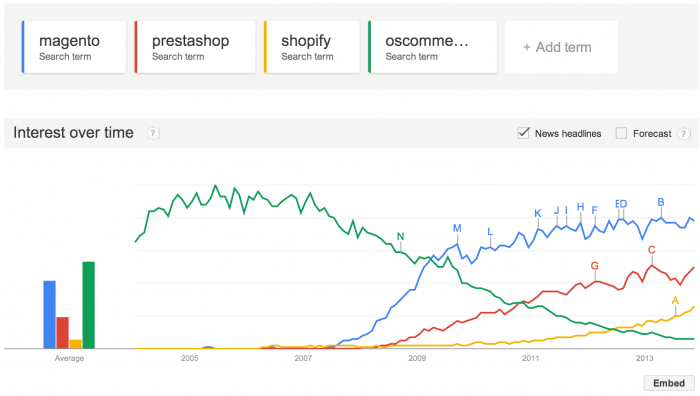 The three CMSs that are possibly most popular right now are Magento, PrestaShop, and Shopify. These are three solutions which I know well and have worked with, and even though I may leave other promising systems out (I’m thinking of OpenCart), these three are, in my view, the three main platforms at this time. In this post I will give a general overview, continue with an individual examination of each solution, and finally give my conclusions in my last post. I have used Google Trends to provide a historical introduction to the birth and evolution of these three CMSs. I have opted to compare these three solutions with the previous reference in eCommerce CMS: osCommerce. This is simply a measurement of interest, based on the number of Google searches for these terms. Magento started to take off in mid-2007, while PrestaShop did so one year later, and interest in Shopify wasn’t significant until 2011. The growth of Magento seems to have become stagnant since 2011, possibly due to the appearance of other solutions by other companies. Even though the level of interest in Shopify is still lower than the other two solutions, its growth curve is very promising. Even though Magento and PrestaShop use a similar model in which customers install their solution in their hosting, Shopify opts for a SaaS model that includes hosting. It should be pointed out that both Magento and Shopify have created SaaS solutions, although so far they don’t seem to be very popular. As regards the technology used, both Magento and PrestaShop use PHP and MySQL. In the case of Shopify, even though it’s implemented using Ruby on Rails, this is not relevant to its SaaS model. All platforms use an API that makes it possible to automate store processes, and even though this may not seem relevant for store users, it allows for greater flexibility when it comes to creating extensions. As we have said before, one of the factors when it comes to choosing a system of this type is the existence of extensions created by the CMS creators or else by the community that surrounds them. In this sense, there are extension marketplaces for all three systems where you can find modules that cover practically any need and which are not given in the standard version. The last comparison that I will give in this post is pricing, as it does not depend on previously explaining how each of the three CMSs works separately. Given that this is a SaaS service, you cannot install Shopify in your server. However, Shopify prices include hosting. Prices vary depending on the functionalities and the volume required by the online store, and the most affordable prices include a percentage of sales. API Master. Expert on Cassandra and big data technologies. have you considered other platforms with more personalization and customization options where you work directly with the developers. for example, http://www.adrecom.net which is one of these types of CMS solutions which also has ecommerce. so it is like reversing the trend of adding CMS features to an ecommerce system. I am sure there are others out there. Magento has unique features which makes it better than others & hence, it is most demanding nowdays. I think that missing out on this list is a bit harsh on Bigcommerce. Their solution is in line with Shopify and Prestashop. In the future, they can even chase Magento.. This is such cool blogs you have here. Really! Are we really talking about OsCommerce in 2015? I think one day OsCommerce will be featured on History Channel. When you compare the prices for Magneto and PrestaShop with any reasonable SAAS hybrid CMS (such as Kooomo, http://www.kooomo.com) you get a pretty clear idea that hybrid systems get the upper hand. These rates are really high and hard to cover financially. So, by my humble opinion, going for Kooomo or something similar is a better solution. The initial fee is much lower, and there are no re-bills, as there is an option of paying by allocating a small percentage of turnover to them. This is more like pay on result approach so it is quite safer than investing tons of money in one of the mentioned solution.